Null’s henchmen (The Gang of Four) and Scul & Bean attack our heroes in a battle to the death. Null disguises himself as Mondo Gecko and tricks Candy Fine – he then uses his demonic powers to control her mind and kidnap her while he escapes with Scul & Bean in their spacecraft. 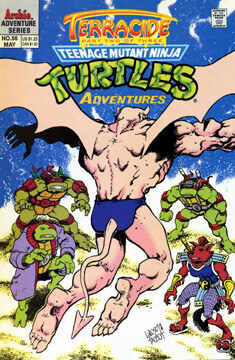 The Gang of Four continue their attack when the Turtles discover that they foes are androids. The TMNT quickly decide to pull no punches and win the battle. Future Raph learns from one of the Four that Null has taken Candy to the dark side of the moon. Everyone boards the Mutanimals ship to chase the villain, but Don and Leo ask to be dropped off near the Coast Guard ship so they can rescue Michaleangelo.